Oh dear. I just realized that I uploaded these photos but almost entirely forgot to post. Posh Pie, as Rose calls it, is one of those fun recipes that reverse engineers a convenience food type dessert into something fancy and yet retaining echoes of the Jell-O pudding box. Many of my fellow Alpha Bakers found the multi-step process frustrating. 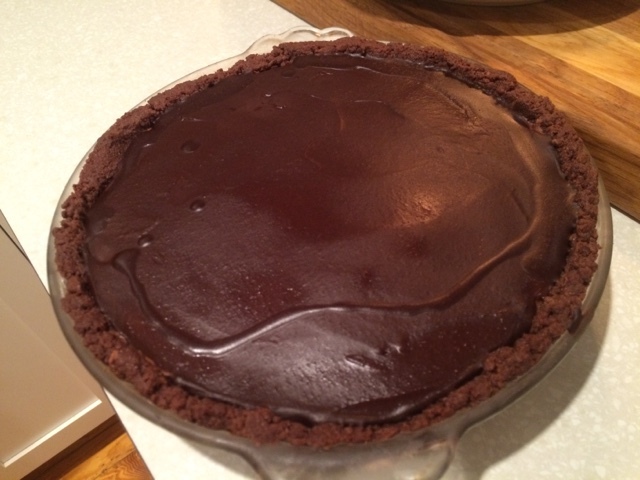 I made the pie over several days (dough, pause, cookies, pause, crust, pause, bavarian cream, pause, ganache) and found that it fitted well into my schedule, but clearly the timetable got pushed to a point where I forgot to post an account. Posh Pie begins with a chocolate cookie crust. One is supposed to cut the cookies out into shapes but since I was planning to crush them up with melted butter in a food processor, I just rolled out a sheet and baked it. 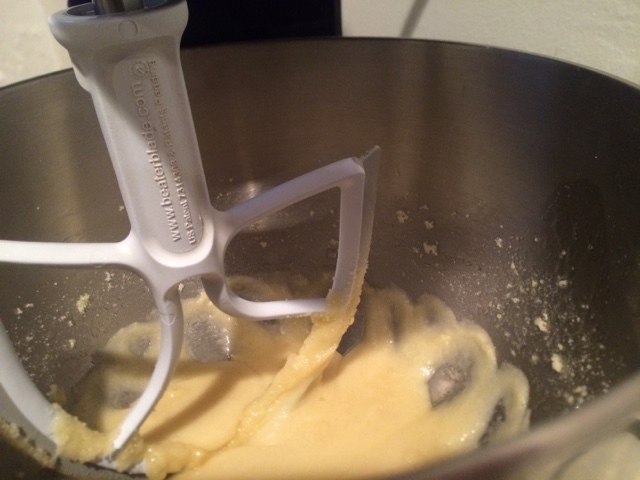 The photo above is butter and sugar glurping around in the mixer. Next step is a chocolate Bavarian cream (fancy analog to the Jell-O pudding, of course). I had actually made this recently for Libby's birthday cake, incorporating Ovaltine, which made the mixture just ever so slightly grainy. This time the texture was perfect, and I slipped in a bit of creamy chai leftover from a Thanksgiving party for part of the dairy, giving it a bit of extra bite. The final step is a shiny (or, in my case, not all that shiny) ganache topping. The pie is, of course, delicious, and as I mentioned has not-unpleasing shades of supermarket snack foods. V. Posh. Love it. One of my friends made a comparison to pudding, too! "Really good chocolate pudding."